Redbet Casino first strikes you as a simple clear cut and easy to navigate online casino. The home page on Redbet is all about the bonuses offered by this casino. A lot of detail has gone into making the site professional and full of all the important information needed to make an informed decision when signing up to an online casino. Redbet covers all the main aspects of online gambling, offering a sports betting section, 2 casino platforms – casino red and casino blue, live casino and poker. The software used by Redbet casino is: Net Entertainment for Casino red, Microgaming for Casino blue and B2B poker network for the poker rooms. These are three of the top software providers all brought to you in one superb online casino. 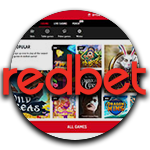 Redbet was started by a few Swedish business men whose background was computer programming and sports betting; so with all the experience and knowledge of the gambling online world this is sure to be a great choice for you to spend your hours playing the latest in online games. Redbet casino is authorized by the LGA in Malta and holds a full gaming license. So now that you have chosen Redbet Casino as your online casino of choice, it is time to get yourself an account to start your gaming career. The main sign up button is in the top right hand corner of the homepage and once you click it will take you to the sign up page which is simple and straight forward enough for anyone to sign up with ease. The casino doesn’t ask for too much detail and keeps things easy all the way through. The first section is your personal information; the second part will be your log name and passwords. The third will be some more personal information such as location and contact details. 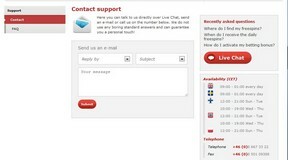 There shouldn’t be any problems at this stage, but just in case there is you will find a live chat button just below the sign up form with a customer care agent eager to help you with any issues you may have. As soon as those few steps are completed you can now move onto playing and depositing at your favourite game. The terms and conditions for Redbet are thorough to say the least! They have covered anything and everything, and they have relayed their message and company policy in easy to read and understand language. There is nothing you can think of that has not been added to the list, leaving no room for error of any kind. By reading the terms and conditions you will be collecting all the information that may come in handy along the way, from the withdrawal limits to the rules of the house. Once you have signed up and read through the terms and conditions, you will want to make your first deposit. This can be done easily; at the top of the homepage you will see your account details. You can click on the deposit link and be taken to the deposit page. Once you are there it is again simple and easy to navigate. The payment methods will be right in front of you so you can’t miss them. You choose the option that is best for you and proceed to move your funds into you player account. One key point to take note of is that whatever method you choose for depositing must be the same method with which you withdraw your winnings! Although all your money will be in one account, it will be split between the providers- so for example if you are winning in casino red but want to move onto casino blue to carry on playing then you will need to transfer your money between the two sub accounts. This can be done by clicking the transfer link and moving the money between the two. Simple. How supportive are Customer Support at Redbet? Redbet Casino can be translated into 10 different languages, and the customer support on offer applies to 5 of these languages which is pretty impressive. The English speaking support agent on the live chat will be there between 9 am and 1am daily to answer all your queries at a speedy pace. The other support agents speaking the other 4 languages are there at specific times and days, this information is all clearly listed in the support section of the casino. For the times when the live support is not available you can always drop them an e-mail which will be replied to at their earliest convenience. Making a withdrawal with Redbet Casino is simple, open your player account and click on the withdrawals button. Here you will find a long list of ways to withdraw along with the minimum withdrawal values and how many working days it will take before you can spend your winnings! They have even listed the fees charged for each method if there are any. All in all, a great overall casino offering the best in the latest gaming offers with a variety of sign up and welcome bonuses to choose from. Very informative with a great customer support offering!